Our lab chairs are suitable for a wide range of purposes and provide the flexibility and durability required for a demanding working environment. Lab seating is suitable for not just laboratories, research centres and educational establishments, but for factories, counters and retail environments. Our range of professional lab chairs have been designed by some of Europe’s leading office furniture manufacturers, and are built to be robust, ergonomic and easy to clean. The ergonomic feature in our chairs consists of a tilting back mechanism gas lift with seat height adjustment and a tilt-back mechanism to ensure high levels of comfort and support. Additionally, all our lab seating comes in a wide variety of specially tailored fabrics, which have been tested for use in a number of different scenarios. In addition to lab chairs, we also have a range of laboratory stools and high-chairs. These designs make standing to work even easier, providing seated support when required. Additionally, we stock a range of ESD (electric static discharge) chairs, which are well suited to environments where electricity or static current is present. Furthermore, a selection of our laboratory stools and chairs are incorporated with a swivel mechanism which enables users to easily move around their workstation, turning easily without causing undue strain or stress on the body. The draughtsman lab chairs are specifically designed for maximum flexibility as the chairs are fitted with a gas height mechanism to alter the height and extend the position of the chair to match your desk. Most items on our laboratory catalogue offer a 5-year warranty, meaning its quality and functionality is guaranteed during that time span. All items have also been tested to ensure the highest standard of chair for use in the home and office. Certain working environments require specialist seating. 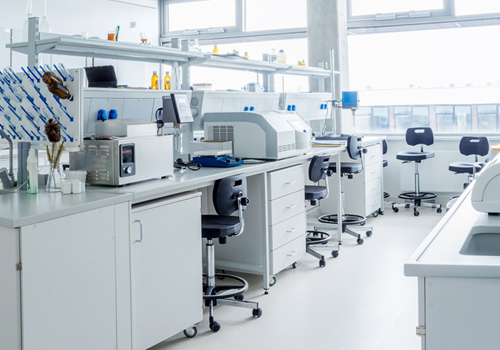 Businesses such as laboratories, research centres, science labs in higher education establishments and factories, have particular demands when it comes to chairs – and it’s important to source the right professional seating for the task. Our laboratory chairs have been specifically tailored to respond to the rigours of a tough working environment. Here’s some information about why they’re well suited to demanding workplaces. Many research-based businesses, not to mention busy factories, regularly use chemicals, dyes, paints and other messy substances as a regular part of their working day. As a result, standard office chairs can quickly become dirty and stained; and certain fabrics simply aren’t suitable for harsh chemical environments. 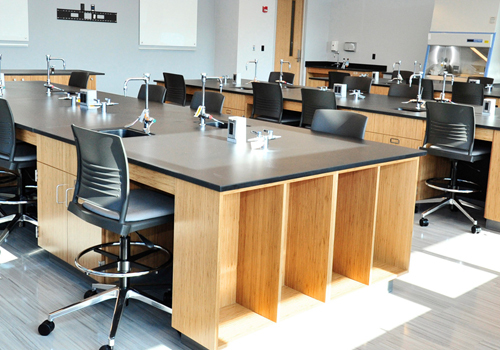 All our lab seating has been designed with simplicity and durability in mind. We offer a range of vinyl laboratory chairs, which is straightforward to wipe clean; and we also offer black vinyl to ensure visible staining is kept to a minimum. It’s not uncommon for certain workplaces to experience a lot of static build-ups, particularly where use of machinery is prevalent, or where there are electric currents. Static electricity can prove problematic for both machinery and humans alike, and it’s important to keep safe when working in such environments. We have a range of ESD chairs in stock, designed to ensure that harmful static electricity is reduced; thus, improving comfort and safety in electronics-based workplaces. All our ESD chairs conform to European standards; causing electrical current to dissipate safely to the earth. Every workplace is different and as a result, will require different styles of laboratory seating. 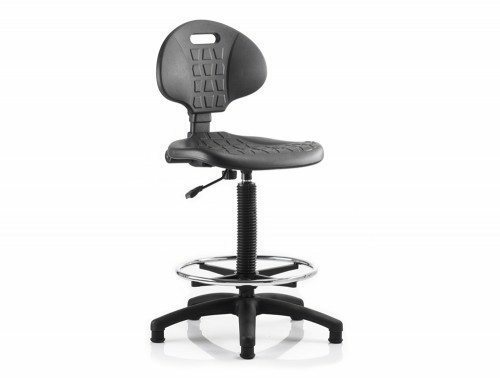 We offer easy-to-move saddle chairs, which can be easily manoeuvred around the workplace – offering greater flexibility, especially to those who regularly need to move from workstation to workstation. We also have a range of tall or high-chair style lab seats, which are perfect for those who work at higher desks, or who prefer to stand throughout the day. Additionally, we offer the classic draughtsman style lab chair, which offers full support, flexibility and easy manoeuvrability. Our range of lab seats are suitable for a huge variety of different purposes. Aside from being suited to laboratories and research-based companies, they’re also perfect for schools, colleges and universities. Additionally, they’re well suited to the factory floor, particularly for factories who require higher seating to operate machinery. Retail environments also benefit from draughtsman chairs, as their flexible, adjustable style is perfect for fast-paced workplaces. We understand how important it is to enjoy full posture support whilst working, particularly in a busy lab or factory. Many of our chairs offer tested ergonomic support, ensuring that workers experience a more comfortable working environment. Lumbar support is a feature in many of our chairs, and some also come with adjustable arm-rests, height control and even neck support. If you’d like to find out more about our range of Lab Seating or discuss your requirements, simply request a callback.